Easter’s Way of the Cross procession in Rome has been led by Pope Francis, with prayers for the poor and the abandoned. Via Crucis ceremony marks Christians’ commemoration of Christ’s crucifixion on Good Friday. 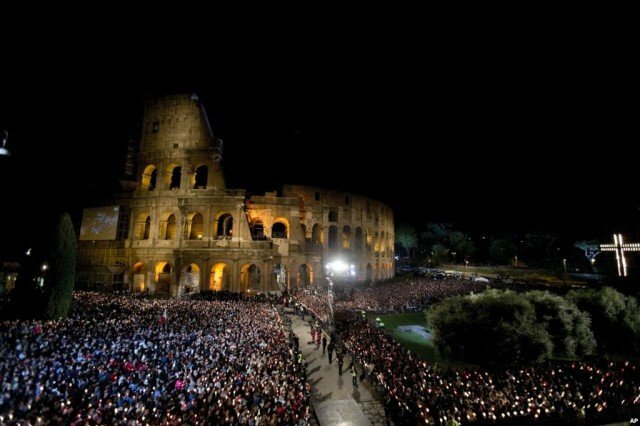 Tens of thousands of people lined the route near the 2,000-year-old Colosseum. Pope Francis heard the Vatican’s official preacher deliver a sermon denouncing greed and the love of money. The procession is part of the Church’s Easter triduum festival. Pope Francis urged the crowd to “remember all the abandoned people” and spoke of the “monstrosity of man” when he lets evil guide him. “Evil won’t have the last word, but love, mercy and pardon will” he added at the end of the Way of the Cross. The sermon, by Father Raniero Cantalamessa, spoke of the injustice of human trafficking and suffering caused by environmental damage. “Money is behind every evil in our society” the preacher declared. The procession route included 14 stages, known as Stations of the Cross, at which specially written meditations were recited. One meditation touched on the plight of child soldiers, while another recalled the deaths of migrants trying to reach more prosperous countries. Other meditations criticized overcrowding in prisons and the treatment of the elderly. Immigrants, prisoners, former drug addicts and elderly people were among those who helped carry a large cross between the different stations. On Saturday night, Pope Francis will celebrate an Easter vigil Mass in St Peter’s Basilica. Easter services will then conclude on Sunday with a Mass celebrating Jesus’s resurrection. Pope Francis will deliver his twice-yearly “Urbi et Orbi” (to the city and the world) message. On Thursday, the Pope washed the feet of 12 disabled people in Rome as part of the Maundy Thursday service commemorating Christ’s Last Supper. Pope Francis broke with tradition by washing the feet of several women and a Muslim man in a ceremony traditionally restricted to men only.